Evidence Bags and Boxes; Security Envelopes; Metal, Glass or Plastic Containers; Packing Cartons; Coin Bags; Cash Boxes; Meters and Valves; Pallet Stretch or Shrink Films; Coated Paper Boxes; Plastic Bags or Poly Bags. 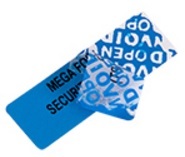 Mat polyester face material with highly visible security message which is revealed when seal is lifted. Trigger message can be OPEN VOID as standard or customisable message. The adhesive will be partially transferred onto the applied surface during triggering. Suitable when sealing evidence is required on the applied surface. Label face can be written on with normal ink pen. 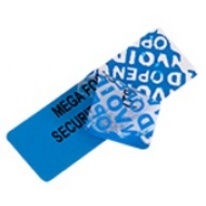 Serial number, company name and logo can be printed onto the label face as well. Barcode printing is an option.